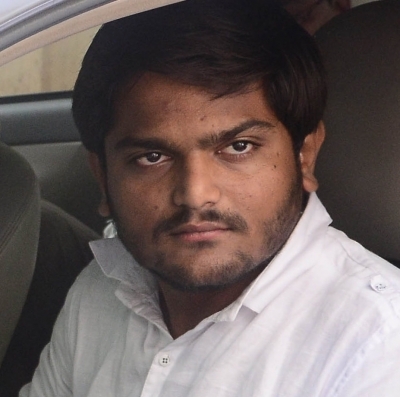 Rajkot, Oct 30 (IANS) Firebrand Patidar leader Hardik Patel, who had given an ultimatum to the Congress to come clear on reservations for his community under the OBC category by November 3, on Monday said the party had agreed to explore constitutional solutions for the purpose while making firm promises on the community’s other demands. Patel was speaking to reporters in Rajkot after a meeting of leaders of his Patidar Anamat Andolan Samiti (PAAS) with Gujarat Congress President Bharatsinh Solanki as well as Siddharth Patel and Arjun Modhwadia in Ahmedabad. “I am neither against the Congress nor in its favour but am against the BJP’s arrogant and autocratic attitude against the Patidars. We maintain that the Congress should explain us how exactly they would grant reservation under the OBC category,” Hardik Patel said. He had threatened through a Twitter message that the proposed November 3 rally of Congress Vice President Rahul Gandhi in Surat would face the same fate as that of BJP President Amit Shah’s public meeting which was disrupted in the diamond city last year, forcing him to beat a retreat. “Aap chahey aakaash se lao ya pataal se laao. Mujhe toh arakshan chahiye. (You get it from heaven or abyss. I just want reservation),” he asserted. He said if the Congress agreed to all its demands and convinces them of how its reservation proposal would hold water constitutionally, they would extend their support to the party in the December Assembly elections. “We will not go with the BJP even if our heads are chopped off or we are sent to jail… We cannot align with people who fired bullets at our chest, who went and urinated in our houses in front of our women, who insulted the descendants of Sardar Patel,” he said. He said the talks with the Congress were satisfactory and the PAAS core committee would now meet and decide whether he should meet Rahul Gandhi on his forthcoming three-day visit to the state. “They have sought time till November 7 to meet constitutional and legal experts to finalise its stance. We will also be inviting two retired judges and people from Rajasthan who have been fighting for reservations for 15 years,” he added.